Along with the force of gravity, all bodies in our solar system hold onto each other energetically and so affect each other. That’s why the ancients named the planets after their Gods and Goddesses – their experience of the world acknowledged and accepted the connection between matter, the imagination and spirit. And the connective energy of the Universe is symbolized by Venus, both the goddess and the planet. It seems Love is the irresistible force that holds everything and everyone together. Carl Jung said that the ancient Gods & Goddesses had become psychological complexes in modern man. And he also believed that at the center of these complexes were archetypes, human behaviors that are inborn and instinctual. To dream, to conceive, to engender, to birth, to protect, to love, to die; These archetypal energies also express themselves on a cosmic level, joining our energies with the other inhabitants of Earth, with our solar system and with galaxies. It seems the Universe lays out the basic conditions for life and for death, for stars and for humans, and gifts us with them, daring us to play along. The planet Venus represents one of the universal archetypes, the archetype of Connection. Under patriarchy, Venus energizes the realm of sexual love, beauty and companionship, the acceptable (to men) aspect of her energies. But her deepest nature represents an essential archetype, the mystery of life expressed through Love and Wisdom, Connection and Wholeness. So when we have such a spectacular celestial meeting of the Source of Life (Sun) and Love and Wisdom (Venus) occurring in our skies, perhaps we need to allow this energy into our hearts and let it inform how we live our lives. Otherwise, we’ll get caught up in the chaos that is stirring in the world because our financial system is broken. Since money seems to be the real god of patriarchy, people will be caught up in confusion, anger and unfortunate violence. But we can help – Venus’s energy can connect us so we realize we’re all in this together, help us work together to solve our problems, and support us when we stand up for truth, justice and compassion. Venus is the planetary energy that rules the heart chakra. The awakened heart leads us to Wisdom. Venus has been a bright, beautiful Evening Star for many months now, but because Earth’s orbit caught up with it on May 15th, Venus now appears to be getting lower in the sky as our Earth races ahead. Venus is retrograde (going back or within) and will soon disappear back into the rays of the sun for a fiery re-birth. After it visibly crosses the Sun’s face on June 5th – 6th, it will disappear again until it appears in the sky before sunrise on June 13th as the Morning Star. Almost all ancient cultures associated this planet with their goddess of Love. The Evening Star is known as Vesper, the gentle wisdom star of evening. We know the Evening Star as the star of wishes and hopes (Star light, Star bright, first star I see tonight.) She was called Stella Maris, Star of the Sea, the light that guides us home. When Venus rises before the Sun, she is known as the Morning Star, Lucifer the Light-Bringer, who heralds the dawn of a new day. This Venus is a warrior goddess of Love, loving herself as well as others, and forging a new path for the Sun (consciousness). This is the aspect of Venus that awaits us on the other side of this rare Venus conjunction. It is a call to defend what we love by standing up for peace and compassion. 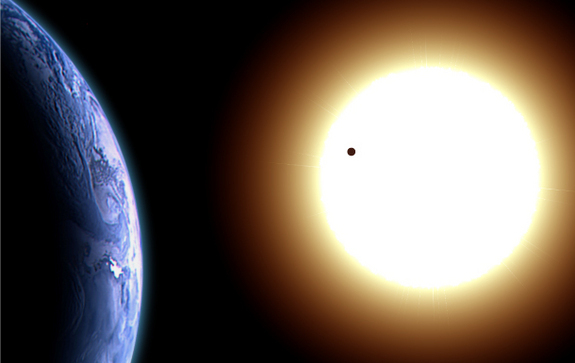 Because the planes of Earth, Venus and the Sun are aligned, we get to see this rare transit of Venus, which happens only four times every 243 years. The spacing between these planetary meetings is very uneven: first it takes 121 – years to happen, then 8 years, then 105 – years, then 8 years again. The last transit occurred in June 2004 and after this June’s planetary dance, there won’t be another meeting for 105 – years, in December 2117. Venus naturally has an eight year cycle, forming a pentagram during its cycle. This is the planet that ancient astronomers used to measure our cosmos – Venus is the measure of our solar system. If we lived in a society that looked to the heavens for meaning, June 5th – 6th second transit of Venus across the face of the Sun would rock the world as a sign of hope for the future. And there would be hope if enough people accept responsibility for letting Love lead the way. Imagine a world where Love was the basis for life’s decisions! Not an unconscious love, but Love as the awareness of our connection with everyone and everything, coming through our imagination and intuition. Love as a foundation for life’s choices and decisions based on a belief that what I do to another I do to myself. Love places us back in the cycle of Life, where we are one and whole. This is the LIGHT of LOVE. That belief is the polar opposite of patriarchal thinking, which configures us as separate and imperfect. Every man for himself! Even though patriarchy has tried to suppress the more feminine right brain holistic view of life, women are often quite adept at operating out of both brains, basing their decisions on right brain connective love and using the left brain to make it so. It actually works well – This transit is attuned to our right brains, so ask your analytical left brain to stand down, open to your imagination and see what you discover. What is your imagination calling you to do?